Kat's Journal | Katalyst for Animal Wholeness, Inc. 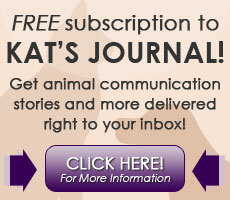 Enjoy a no-cost subscription to “Kat’s Journal”! Sign up where indicated on this page, and your subscription will start with the next newsletter to be issued. Please feel free to let others know as well about this no-cost subscription offer to Kat’s Journal! NOTICE: Your subscriber information is considered confidential and is never shared with others. To CHROME users: Since this form does NOT collect sensitive information it is not secured. Your browser may advise you about this. Please go to the CHROME blog for more information. Copyright © Kathleen A. Berard, All Rights Reserved.